24" Bicycle Features 21 Speed, 24x2.1 Tires, 36 Spoke Alloy Rims, Micro Shift Twist Shifter, Shimano Rear Derailleur, Linear Pull Brakes & Levers, Quick Release Seat Post Clamp, and Dual Suspension Aluminum Frame. 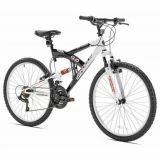 26" Mountain Bicycle Features 36 Spoke Alloy Rims, 21 Speed Twist Shifters, Shimano Rear Derailleur, Linear Pull Brakes & Levers, Dual Suspension Alloy Frame, Quick Release Seat Post Clamp, and 21 Speed Micro Shift Twist Shifter. 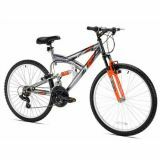 26" Fitness Bicycle Features Alloy Stem, Comfort Saddle, 36 Spoke Alloy Rims, Front & Rear Fenders, 7 Speed Twist Shifters, Shimano Rear Derailleur, Deluxe Aluminum Frame, Front & Rear Caliper Brakes, and Quick Release Seat Post Clamp. 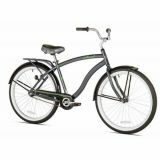 26" Fitness Bicycle Features Alloy Stem, 3 Piece Crank, Coaster Brake, Soft Wide Saddle, Aluminum Frame, Flat Cruiser Pedals, 36 Spoke Alloy Rims, Deluxe Alloy Rear Rack, Quick Release Seat Post Clamp, and Deluxe Wide Front and Rear Sport Fenders. 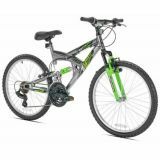 26" Mountain Bicycle Features 36 Spoke Alloy Rims, Shimano Rear Derailleur, Steel Dual Suspension Frame, Quick Release Seat Post Clamp, Alloy Linear Pull Brakes & Levers, and 21 Speed Micro Shift Twist Shifters. 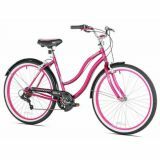 26" Fitness Bicycle Features Comfort Saddle, 36 Spoke Alloy Rims, Front & Rear Fenders, Low Step Steel Frame, 7 Speed Twist Shifters, Shimano Rear Derailleur, Front & Rear Caliper Brakes, and Quick Release Seat Post Clamp. 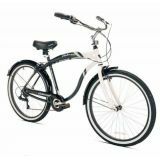 Hybrid Bicycle Features Steel Frame, 700 x 38c Tires, Front Suspension, Front & Rear Alloy V-Brakes, Quick Release Seat Post Clamp, 36 Spoke High Profile Alloy Rims, and 21 Speed Shimano Twist Shifting.